Human chorionic gonadotropin, or hCG, is a hormone medication often administered as an intramuscular injection. Women undergoing fertility treatment often self-administer hCG injections at home or have someone else give them an injection to trigger ovulation or egg maturation. Administering an injection can cause harm if not done correctly. Most clinics that require home administration of injectable medications insist that the person giving the injection come to the office to learn to give the injection. To give an hCG injection requires training and preparation. Read instructions to gain an understanding of what steps come next. This helps avoid opening needles or packages too soon and risking contamination. Some doctors have specific instructions on mixing or injecting that must be followed for the drug to be effective. Gather all supplies in one location after reading the instructions. Wash your hands thoroughly. Open the hCG box, which contains a vial of water and one of powder. Remove the plastic caps from the top of the powder and water vials. Wipe the rubber stopper beneath the plastic pop-off top with an alcohol wipe. Open the syringe packaging, which has the needle already attached. Don’t remove the plastic cap from the needle until ready to mix the medication. Remove the plastic cap from the needle, being very careful not to touch the needle. If the needle touches anything accidentally, discard it and open another syringe. Pull the plunger back to around the 1 cc or 1 ml level. Insert the tip of the needle into water vial and push the air into the vial. This makes it easier to withdraw fluid. With the tip still in the vial, turn the vial upside down. Make sure the tip stays in the fluid. Withdraw the prescribed amount of fluid from the vial. Being careful not to contaminate the needle, inject the fluid into the powder vial by pushing the tip through the rubber stopper and pushing on the plunger. Remove the needle from the vial and discard the needle and syringe. Select a site for injection. For intramuscular injections, the upper outer quadrant of the buttocks or top of the thigh are commonly used sites. Swab the site with an alcohol wipe, then let dry. Inspect the vial to be sure the drug has mixed. Don’t shake the vial. Agitate gently once or twice if necessary. Unwrap a new syringe. Swab the top of the bottle with an alcohol wipe again. Remove the plastic cap and insert the tip of the needle into the vial. Invert the vial and withdraw the required amount of medication. Flick the syringe lightly to remove air bubbles. Grasp the skin around the injection site firmly with the thumb and forefinger to anchor the skin. With a firm, quick motion, push the needle all the way into the skin. Pull back slightly on the plunger to check for blood in the syringe. If blood appears, indicating that the needle is in a blood vessel, remove the needle and discard the medication. Let go of the skin and push the plunger down, injecting the medicine. Remove the needle from the skin and discard the needle and syringe properly. If the site is bleeding, apply pressure for a minute or two. Apply an adhesive bandage to the site. Insert the needle like throwing a dart, in one smooth motion. It hurts less. 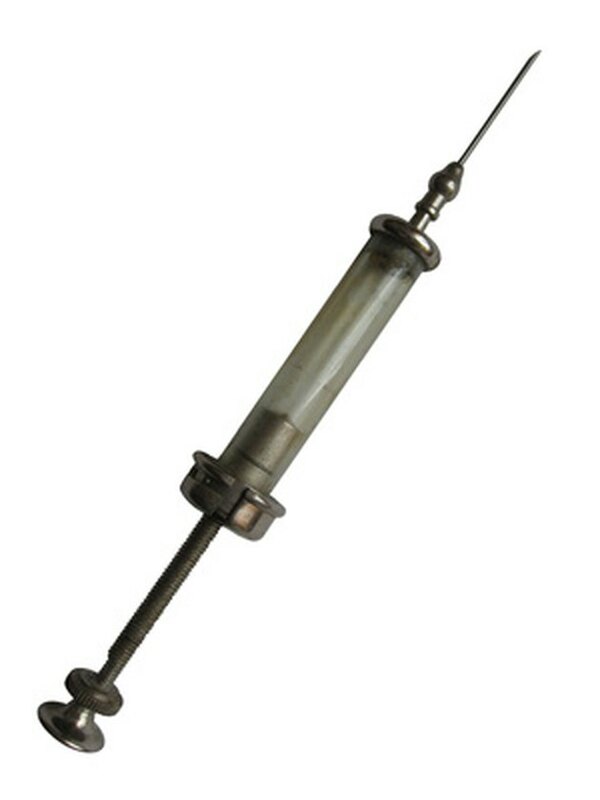 If the needle becomes detached from the syringe while in the skin, just grasp the end and pull it out and start again. Always inject into the buttock by dividing the cheek into four areas and injecting only into the upper outer quadrant. The sciatic nerve runs down the middle of the buttock and can become very painful if the injection is too close. If at any point the tip of the needle touches anything it shouldn't, throw it out and start again. If the area around the injection reddens or swells, inform your doctor. Don't shake the vial to mix the medication.